GitHub - Pixplicity/letterpress: Custom fonts without writing code. Custom fonts without writing code. Want to be notified of new releases in Pixplicity/letterpress? Custom typefaces without a single line of code! With Letter Press, adding custom fonts to your app means not a single line of code is needed; simply add the fonts to your app, replace your views with their Font counterparts, and specify the fonts through attributes, styles and themes. All fonts are referenced into (subdirectories of) the app's assets folder. You can apply your custom fonts in a few ways: by using the theme, by specifying a specific style per view, or on the view explicitly using view attributes pix_font, pix_fontBold,pix_fontItalic or pix_fontBoldItalic. Check out the sample app to see how easy it is to set up. The easiest example is to set a typeface through layout attributes. In your layouts, replace Android widgets with the Font counterparts. 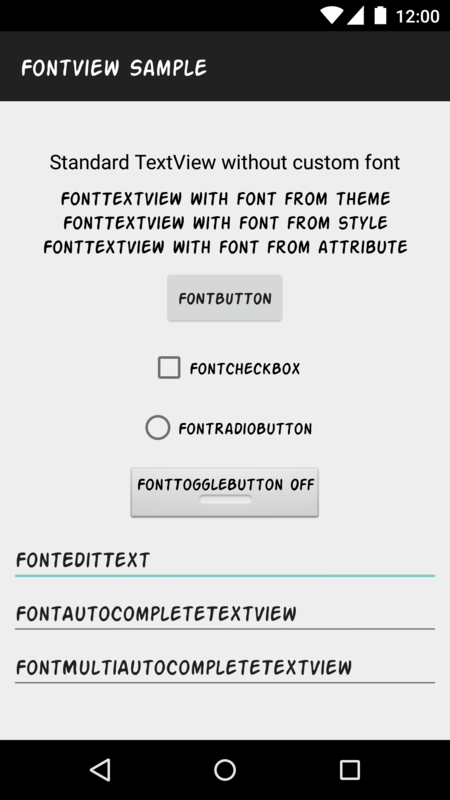 For instance, use FontTextView instead of TextView and it will use the Action Man font. Through a style, you can provide the same style to multiple views. By overriding the default parent style, it's easy enough to swap out existing styles (but is not required).